My daughter has a new addiction. 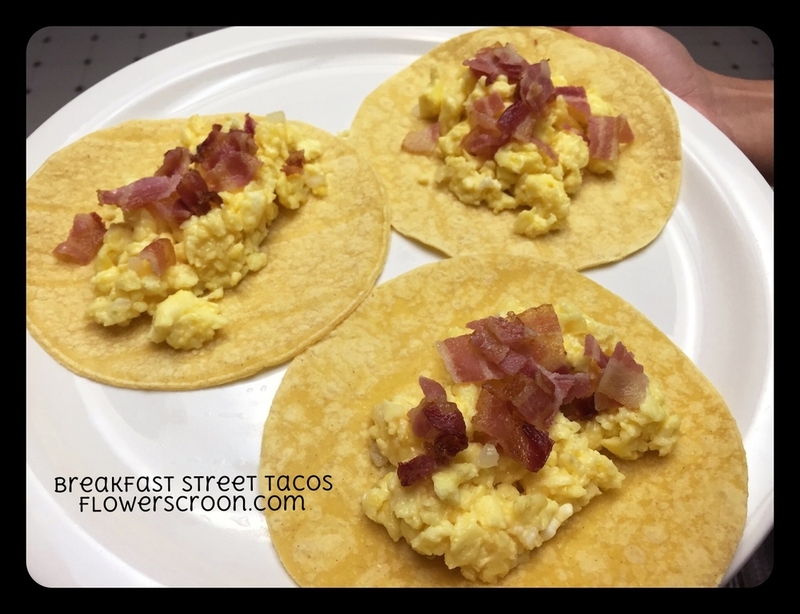 What started out as my breakfast burrito recipe (that she wasn't interested in) evolved into a street taco style breakfast she loves. Since this recipe omits a lot of what I would normally put in my breakfast burrito (pico de gallo, tomatoes, mushrooms, spinach) there's not much chopping involved and it's super teenager friendly. Plus, it's healthy! The idea of eating scrambled eggs on a corn tortilla would have never occurred to me, so all the credit goes to my daughter. I personally prefer a whole wheat low-carb tortilla cut in half for my breakfast burrito, but this kitchen welcomes all new ideas! -Arrange tortillas on a plate. Dive the scrambled eggs into 3 portions and place on each tortilla. Top with bacon. This recipe is simple and kid-friendly. The corn tortillas add more carbs than I need, but for a busy teenager, this is the perfect meal to kick-off a 16+ hour day.